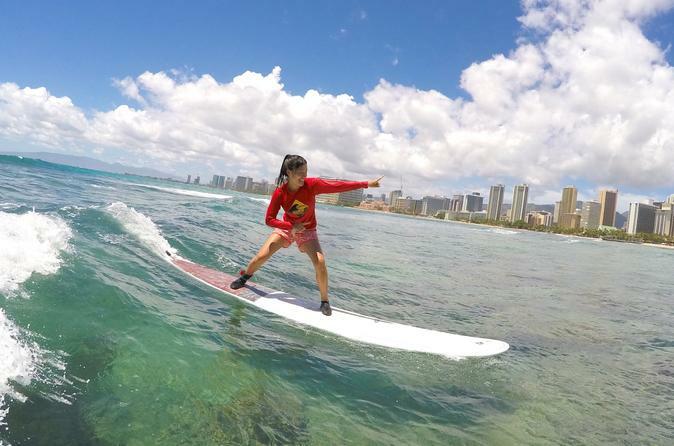 Enjoy the best surfing experience Waikiki can offer! This 2-hour, private surf experience offers high-quality boards, reef shoes and rash-guards, and and video viewing after the lesson in a luxurious Mercedes-Benz Sprinter van. Your professional surf guides combine to provide the ultimate surfing experience, full of high-end swag, video/photo packages, as well as custom tours. Instruction is catered to all ages and skill levels, and hotel pickup and drop-off is included from select Waikiki hotels. Before your lesson, you will be picked you up from one of 5 hotel locations in Waikiki. Once that operator has met you at your hotel, you'll ride in an air-conditioned surf bus to a nearby Waikiki surf break, where you have a luxurious Mercedes Benz van as a "command center" to prepare for the lesson. Watch a short video on surfing safety and discuss the current conditions, and your instructor will break down your surfing experience and listen to any concerns. Next it's time to get geared up with a rash guard, board, and reef shoes, and make the very short walk to the beach to start the lesson on the sand. During the land lesson, you'll learn the basics of paddling out and how to pop up on the board, and if you're already an experienced surfer who knows how to pop up on waves, you'll talk on land about specific skills where you'd like to see some improvement. During this 2-hour private surfing tour, you'll spend about 1 hour and 45 minutes of the tour out in the water, working with coaches who together have over 75 years of experience. All the instructors are passionate about surfing and love to share the stoke, and since safety is always a top priority, two instructors are in the water at all times during the lesson. After learning to stand up and ride the waves, retreat to the shade of an onsite tent to relax and hang with the instructors, or enjoy just sitting and watching the waves you've been riding for the last couple of hours. When ready to go, you'll then head back to the mobile command center so you can check out photos and videos, or maybe buy some swag you take back home as souvenirs. With salt in your hair and a sense of accomplishment, the tour ends when you're driven back to your Waikiki hotel.